There is no smoke without fire, and in the last month or so we have seen quite a few leaks about two upcoming BlackBerry handsets - the Bold Touch 9900 (a.k.a. Dakota) and the Bold Touch 9860 (a.k.a. Monza/Monaco). If these stories are not enough to convince you that these handsets' release is imminent, then we have two promo videos to boost this claim - as a matter of fact, they don't reveal much about the said phones, but it's still nice to see them, as they reiterate the notion that the BlackBerry Touch 9900 and the BlackBerry Touch 9860 are nearing release. A fact it is that there are not many secrets left about these devices, as the latter got extensively previewed thanks to tutorial videos posted on YouTube, not to mention that after that it received its first hands-on thanks to some Thai guy, while the former got its release details and specs leaked, as well as some telling pics. According to the leaked Q2 BlackBerry roadmap, which we posted back in March, the BlackBerry Bold Touch 9900 is to be launched in May, while a separate leak claims the handset is to sport a 1.2GHz Snapdragon processor, 2.8-inch VGA screen, physical QWERTY, 5MP camera and 768MB of RAM. 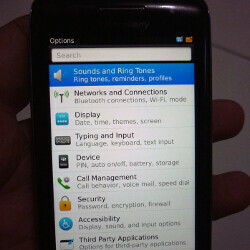 Both handsets are powered by BlackBerry OS 6.1. It's likely that they will be announced and possibly even launched during BlackBerry World, which is to take place in May, although there is no hard evidence to support this hypothesis.